Did you know that you can make pretty much anything they sell at the stores and restaurants yourself? Well you can. You can probably make it better too. Loaded nachos came to me as I kept hearing people talk and post instagram pictures about Cool Ranch Doritos tacos from Taco Bell when they came out earlier this month. I started thinking about tortilla chips, meat, cheese and salsa. Since there is no way someone would catch me at Taco Bell, I figured I’d make a nacho favorite myself. I loaded the nachos with cooked ground turkey, cheddar cheese, and the salsa I made a few days prior. It was amazing. If I was home alone I think I would have scarfed this down myself. But that wouldn’t be very healthy, now would it? I’m not supposed to be eating cheese but I just can’t give the stuff up! HELP! I need a cheese intervention. My doctor will kill me when she sees this cause she says I might not be able to eat tomatoes either. Heat coconut oil in a frying pan on med-high heat. Mix meat with salt and pepper. Cook ground turkey until lightly browned. 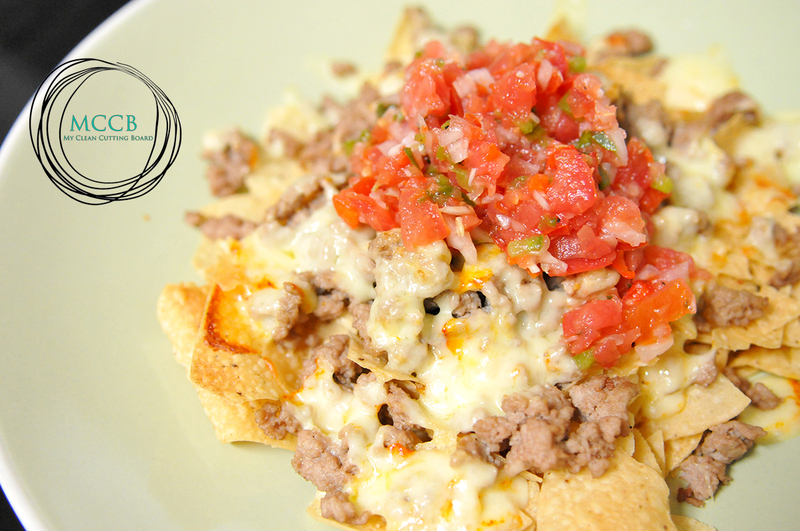 Load an oven-safe plate with tortilla chips, meat, and cheese. Place in oven on broil for 5-8 minutes. Watch carefully. Leave it too long and you’ll have burnt nachos. No bueno! Carefully remove and top it with salsa. By the way, eating like this won’t make you fat. But eating more calories than you burn daily will. I’m not sure how many calories each serving is. But please don’t eat this and just sit on the couch the rest of the day unless your goal is to gain weight. Go out and do something. Ride bike, walk the dog or the kids-whatever. Get active.